The first thing that strikes you when you see the new Idea Shop at IIT’s University Technology Park is the wide-open space-all 13,000 square feet of it. The area is designed to stimulate creative, team-based projects, so flexibility and roominess were core design principles. Clearly, there’s plenty of space for big ideas. The expansiveness speaks directly to the purpose of the Idea Shop, which is to facilitate innovation and collaboration without constraint. The shop itself is a prime example of the sort of work it is intended to foster. By June, only a few months after the space became available, it was fully operational and already as high-tech a space as existed on Main Campus, with eight Mac mini-powered projectors mounted to the ceilings and every wall covered with a special writeable paint that allows students to scrawl their ideas directly on the wall. The Idea Shop features: an exhibition hall, a spacious multipurpose room, plenty of white board surfaces, and space for special events, like the Exelon Summer Institute. One of Walther’s instructors, Senior Lecturer David Gatchell, agrees and is excited about the arrival of additional rapid-prototyping equipment. (The Idea Shop already boasts two 3-D prototyping machines and a laser cutter, but more equipment is on the way.) Gatchell says the ability to generate product prototypes quickly will be especially useful for students, who, unlike professionals, do not work together all week and thus benefit greatly from enhanced productivity during their twice-weekly meetings. The process that Gatchell and his students are pursuing is “design thinking”-a designer’s approach to innovation and creative problem-solving-something IIT hopes to emphasize at the Idea Shop and in its IPRO courses. 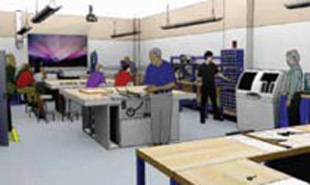 Sectional tables allow for group or solo study, 3-D prototyping machinery and a laser cutter are among the state-of-the-art equipment, and IPRO teams benefit from the versatile surroundings. IIT’s leaders believe that design thinking is beneficial for and applicable to students in all disciplines—either as a primary mode of problem solving or, minimally, a complementary one. The university’s 2009 strategic plan envisions fostering a unique educational experience at IIT that is defined by creativity, leadership, entrepreneurship, innovation, and the design process. The plan emphasizes both interdisciplinary collaboration and more work that fuses education and research. IPRO courses such as the one featuring the fishhook project are prime examples of that sort of experience, just as the Idea Shop exemplifies a space designed to cultivate such experiences. The educational method is called “open-ended, project-based learning”—something that IIT has emphasized in the past. Open-ended learning refers to projects in which the student defines and pursues a path of exploration, often pursuing a creative means of solving a problem with no preconceived solution. Such work requires students to develop hypotheses, test theories, adapt to changing variables, and prototype and test potential solutions, which fosters advanced learning and cognitive development. In the process, students also develop teamwork and leadership skills. The principles of open-ended, project-based learning incorporate many elements of design thinking, an area in which IIT has a strategic advantage. Design thinking is central to the university’s legacy, dating from the IIT tenures of Ludwig Mies van der Rohe and Laszlo Moholy-Nagy, leaders of the influential Bauhaus design movement of the early twentieth century, to today, at IIT’s top-ranked Institute of Design. Because this style of learning is a focus of IIT’s academic platform, in some ways it is no surprise that the Idea Shop came together so quickly. Even though the university identified the Idea Shop’s ultimate home only this year, the concept of the shop dates back a decade. It received a jolt in 2008, when provost Alan Cramb joined the university and was given a tour by Mike Gosz, vice provost for undergraduate affairs. During the tour, the pair visited the traditional campus highlights, but Gosz also took Cramb to an open space, off the beaten path on the fourth floor of Machinery Hall. It wasn’t exactly a showplace, but Gosz tried to instill a vision for the potential of a wide-open, collaborative student space. Cramb liked the idea and they began looking for a home for the Idea Shop. In February, when Wexford, the real estate developer of University Technology Park, approached them about an affordable available space in the lower level of UTP’s Technology Business Center that could be converted quickly, they jumped. “In March, this space was nothing. It was an unfinished basement,” Gosz remembers. Now, he believes the Idea Shop is well on its way to serving a purpose similar to that of the Fab Lab (short for fabrication laboratory) at Massachusetts Institute of Technology, where students collaborate to develop and refine new ideas. The next step is to tweak the university’s courses to accommodate the dynamic learning the Idea Shop will facilitate. One way the Idea Shop will help to serve that goal is through a counterintuitive concept in higher education—larger classes. While an IPRO team typically has no more than a dozen members, two prototype IPRO sections this fall each will have 50 students. That will invite the broader perspectives of more students from different backgrounds and programs, and also accommodate a multidisciplinary teaching team as well as guest speakers. From there, the sections will split into the small teams that will work together on IPRO projects. That’s where the stations—the projectors sprinkled throughout the Idea Shop, with every square inch of wall space a functional white board—come into play. As the students head off to work in teams, each team will be able to access the features of a high-tech corporate conference room, not to mention the prototyping equipment. The Idea Shop’s impact will extend beyond IPRO, Jacobius predicts. Although IPRO teams likely will serve as the Idea Shop’s anchor tenants, IIT’s Entrepreneurship Academy and other entrepreneurial activities will be housed in the shop. This summer, the space was used for the Exelon Summer Institute for first-year IIT students and a math camp for high school students. The long-term, team-based projects will better prepare students for life after college, according to John Stoner, an intellectual property lawyer who teaches IPRO courses as an adjunct faculty member. “This type of experience will facilitate the students’ transition from an academic environment to a professional one, where this mode of collaborative, multidisciplinary work is very common,” he says.